OAKLAND, California -- A Major League Baseball player who became the first baseball player to kneel during the National Anthem says he was refused service by a waiter at an Alabama restaurant. "He was like, 'Oh you're that guy huh,' he goes, 'You're the guy.' I was like, 'Excuse me?' He goes -- 'You're the guy who took a knee.' 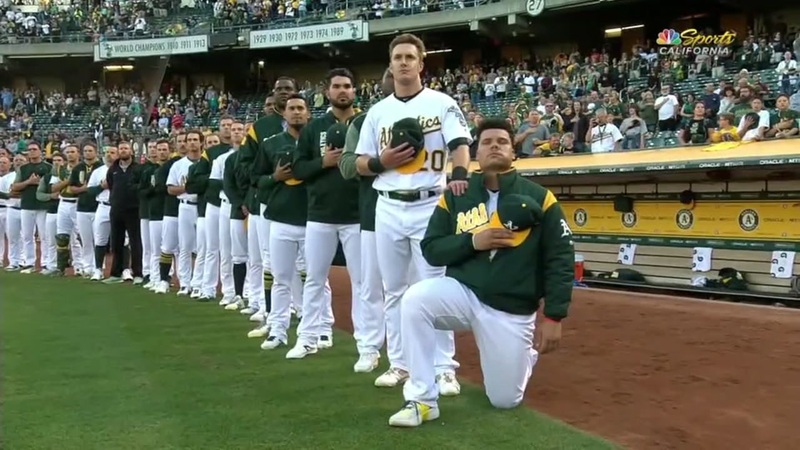 He goes -- 'I voted for Trump and I stand for everything he stands for,'" said Oakland A's Bruce Maxwell, describing the incident. "And I said, 'Oh really.'" Maxwell took a knee during the A's game at the Coliseum on Sept. 23. He told TMZ Sports that the restaurant incident took place during lunch with a city councilman the day he returned home to Alabama. Maxwell says he and the councilman complained to management and got a new server. He says he will continue to fight against racial injustice. "And like I said -- unless you're subject to it, you won't understand it, you won't feel it," Maxwell added. "But I'm 26 years old. I'm respectful. I'm educated, and it still happens to this day. So that's the reason why I'm kneeling." Maxwell says there have been a lot of positives from his demonstration, including a new friendship with Colin Kaepernick. Click here for a look at the latest national anthem protests.